Why Print Marketers Excel At Resonating With an Audience - Broadstroke, Inc.
Any solid relationship, regardless of the type you’re talking about, has the core foundation of intimacy in common. This is true whether you’re talking about your relationship with your significant other, your relationship with your best friend, or even the relationship between yourself and your favorite brand. If any relationship is going to be successful, it must have that basis of close familiarity or friendship, a warm confidence upon which everything else is built. So, how do you help cultivate intimacy with someone, particularly regarding a brand and its target audience? Easy. You resonate with them. You focus your efforts not on saying how great your products or services are, but by using images and text to carefully evoke memories, feelings, and emotions within your audience at any and all opportunity. Emotions are something that print marketers have come to excel at over the years for a number of important reasons. One of the reasons why print marketers are so great at resonating with an audience has to do with the natural benefits of print. It’s inherently an intimate medium, especially when compared with something like email. Customers have gotten savvy; they know that even a personalized email is something you probably generated in seconds. A personalized piece of print collateral, on the other hand, took a lot more effort. You had to think long and hard about every aspect of your print mailer because you only got one shot at it. If your customer ignores Monday’s email, you can instantly try again on Tuesday (or even Monday afternoon). The same is not true of print. You had to go over every detail and every last design choice in your mind to make sure you would invoke every potential reaction. You had to put your heart and soul into it, making sure it was *just right. * You had to send it in the mail and wait patiently to see what reaction you would get. Customers can feel this. They appreciate it. In a world where they’re constantly being bombarded by marketing messages every time they turn on their smartphones, it’s something they want more of. These are likely the major reasons why 43% of customers find print ads less annoying than online ads, but why they also consider print collateral to be inherently more trustworthy, too. Another one of the major reasons why print marketers are so great at resonating with an audience is because they know how to play to the strengths of the very medium itself. One of the most exciting things about print is that it is interactive. How you engage with a customer can vary depending on the specific type of customer you’re talking about. 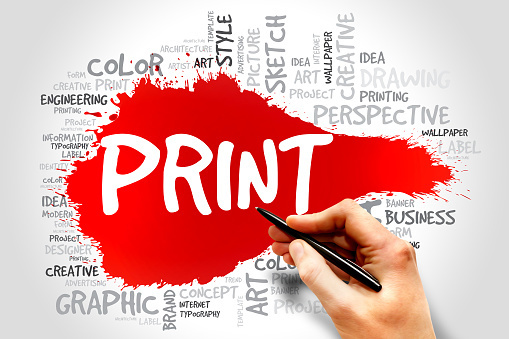 To put it another way, print is something real, which is a major benefit that you just can’t put a price on in today’s digital world. In recent years, forming this type of unshakable bond has become the major goal of marketers everywhere, even going beyond just buying and selling. If you can convince someone to make a purchase, you’ve made a sale. Congratulations! If you can plant the seeds of intimacy within someone and really resonate with them, you’ve just created the type of loyal brand advocate that will last a lifetime. We believe that it’s a technique that print marketers have honed over the years and they’ve gotten exceptionally good at, to say the least. At Broadstroke, Inc., we provide expert turnkey service from concept to design to first-rate finished product. Copyright © Broadstroke, Inc. All rights reserved.